Based on the story and characters from the Oscar®-winning DreamWorks animation film, this hilarious and spectacular production turns the world of fairy-tales upside down in an all-singing, all-dancing, must-see musical comedy. 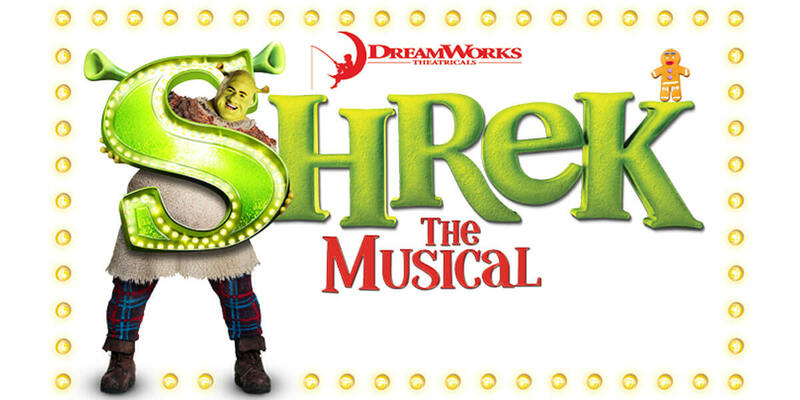 Join Shrek, (Steffan Harri) and his loyal steed Donkey as they set off on a quest to rescue the beautiful Princess Fiona (Amelia Lily) from her tower, guarded by a fire-breathing love-sick dragon. Add the vertically challenged Lord Farquaad, a gang of fairytale misfits, and a biscuit with attitude, and you've got an irresistible mix of adventure, laughter, and romance, guaranteed to delight audiences of all ages! *Recommended for ages 5+. No under 3s permitted. **With every full price adult ticket purchased for the 7PM performance on Halloween night 31 October, a child (16 or under) will go half price.